A cruise onboard Celebrity Reflection is the ultimate escape. Feel everyday life wash away with the tide as you watch the ocean from a secluded hideaway cabana in the Alcoves, restore and rejuvenate both body and mind at the luxurious Canyon Ranch spa, or visit our newly added Tiffany and Swiss Watch stores onboard. Why not head to the World Class Bar when night falls? Creative cocktails are crafted using modern mixology methods and often unexpected ingredients. Or how about a cinematic night under the stars with A Taste of Film at the Lawn Club. It's an exciting way to enjoy the great outdoors, satisfy your love of movies, and dazzle your taste buds all at once. Designed with your special needs in mind, accessible Sky Suites feature more space and thoughtful additions to make your time on board as comfortable as possible. Accessible Sky suites feature wider doors, roll-in showers, grab bars and other special features for guests with mobility disabilities and other disabilities. 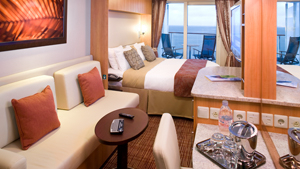 Celebrity Suite come complete with private bathroom, vanity area, hair-dryer, interactive TV, radio and phone. Penthouse Suite come complete with private bathroom, vanity area, hair-dryer, interactive TV, radio and phone. The Reflection Suite-our fleet's first two-bedroom suite with sea-view bathroom-is nestled in the highly-desirable corner location near the new Signature Suites. This private section is accessible only to guests carrying a special cardkey. Here you'll sleep on a Premium Reverie® mattress with the ground-breaking Reverie® Dream Sleep System™. An iPad® with the Reverie Remote app acts as a remote control allowing you to easily operate the lights and TV in the stateroom, massage features, and elevation of the mattress. Experience the luxury of European-style butler service 24/7 for assistance with unpacking, in-suite lunch and dinner, afternoon tea, evening hors d'oeuvres plus complimentary espresso and cappuccino. Sea-view bathroom extends out over the edge of the ship, veranda tubs offer a soothing rain shower, expansive veranda has lounge seating. Accommodates six. 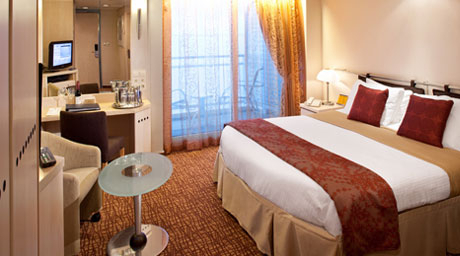 Approximate Size Stateroom: 1636 sq. ft. Veranda: 194 sq. ft. When you stay in a Royal Suite, you'll enjoy the luxury of European-style butler service. This includes assistance with unpacking and packing. In-suite lunch and dinner service. Afternoon tea. Evening hors d'oeuvres and complimentary in-suite espresso and cappuccino from Café al Bacio. Separate living room and dining area and a veranda with whirlpool and luxurious lounge seating. 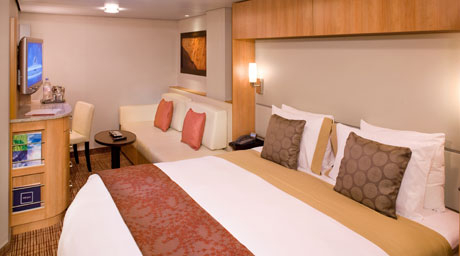 Approximate Size Stateroom: 590 sq. ft. Veranda: 158 sq. ft.
Sky Suite come complete with private bathroom, vanity area, hair-dryer, interactive TV, radio and phone. Signature Suite come complete with private bathroom, vanity area, hair-dryer, interactive TV, radio and phone.